Unconsciousness is when a person is unable to respond to people and activities. Doctors often call this a coma or being in a comatose state. Other changes in awareness can occur without becoming unconscious. These are called altered mental status or changed mental status. They include sudden confusion, disorientation, or stupor. Unconsciousness or any other sudden change in mental status must be treated as a medical emergency. Unconsciousness can be caused by nearly any major illness or injury. It can also be caused by substance (drug) and alcohol use. Choking on an object can result in unconsciousness as well. Brief unconsciousness (or fainting) is often a result from dehydration, low blood sugar, or temporary low blood pressure. It can also be caused by serious heart or nervous system problems. A doctor will determine if the affected person needs tests. 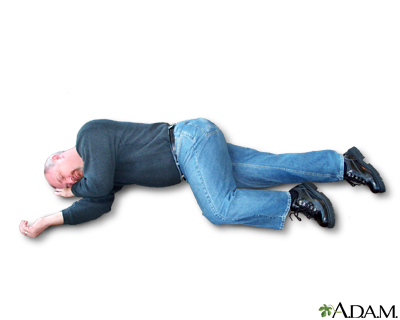 Other causes of fainting include straining during a bowel movement (vasovagal syncope), coughing very hard, or breathing very fast (hyperventilating). The person will be unresponsive (does not respond to activity, touch, sound, or other stimulation). Being asleep is not the same as being unconscious. A sleeping person will respond to loud noises or gentle shaking. An unconscious person will not. Wrong answers or not being able to answer the question suggest a change in mental status. Call or tell someone to call 911. Check the person's airway, breathing, and pulse frequently. If necessary, begin CPR. 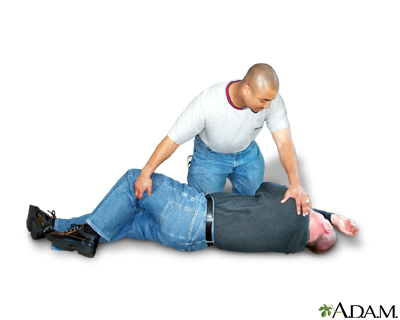 If the person is breathing and lying on their back, and you do not think there is a spinal injury, carefully roll the person toward you onto their side. Bend the top leg so both hip and knee are at right angles. Gently tilt their head back to keep the airway open. 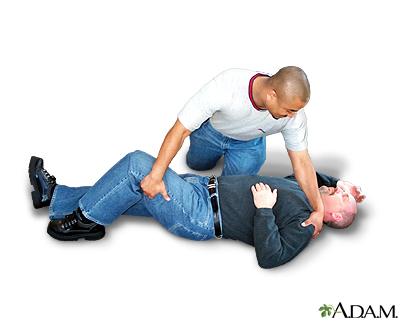 If breathing or pulse stops at any time, roll the person onto their back and begin CPR. If you think there is a spinal injury, leave the person where you found them (as long as breathing continues). If the person vomits, roll the entire body at one time to their side. Support their neck and back to keep the head and body in the same position while you roll. Keep the person warm until medical help arrives. If you see a person fainting, try to prevent a fall. Lay the person flat on the floor and raise their feet about 12 inches (30 centimeters). If fainting is likely due to low blood sugar, give the person something sweet to eat or drink when they become conscious. Continue CPR and keep checking to see if the object is dislodged until medical help arrives. DO NOT give an unconscious person any food or drink. DO NOT leave the person alone. DO NOT place a pillow under the head of an unconscious person. DO NOT slap an unconscious person's face or splash water on their face to try to revive them. Avoid situations where your blood sugar level gets too low. Avoid standing in one place too long without moving, especially if you are prone to fainting. Get enough fluid, particularly in warm weather. If you feel like you are about to faint, lie down or sit with your head bent forward between your knees. If you have a medical condition, such as diabetes, always wear a medical alert necklace or bracelet. Diabetes is a long-term (chronic) disease in which the body cannot regulate the amount of sugar in the blood. American Red Cross. First Aid/CPR/AED Participant's Manual. 2nd ed. Dallas, TX: American Red Cross; 2016. Bassin BS, Cooke JL. Depressed consciousness and coma. In: Marx JA, Hockberger RS, Walls RM, eds. Rosen's Emergency Medicine: Concepts and Clinical Practice. 8th ed. Philadelphia, PA: Elsevier Saunders; 2014:chap 16. Crocco TJ, Goldstein JN. Stroke. In: Marx JA, Hockberger RS, Walls RM, eds. Rosen's Emergency Medicine: Concepts and Clinical Practice. 8th ed. Philadelphia, PA: Elsevier Saunders; 2014:chap 101. DeLorenzo RA. Syncope. In: Marx JA, Hockberger RS, Walls RM, eds. Rosen's Emergency Medicine: Concepts and Clinical Practice. 8th ed. Philadelphia, PA: Elsevier Saunders; 2014:chap 15. Kleinman ME, Brennan EE, Goldberger ZD, et al. Part 5: adult basic life support and cardiopulmonary resuscitation quality: 2015 American Heart Association guidelines update for cardiopulmonary resuscitation and emergency cardiovascular care. Circulation. 2015;132(18 Suppl 2):S414-S435. PMID: 26472993 www.ncbi.nlm.nih.gov/pubmed/26472993.